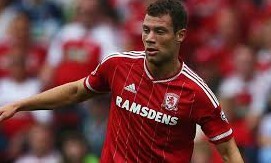 Wigan Athletic have signed 23 year old winger Yanic Wildschut from Middlesbrough on a three month loan. Wildschut has made 11 appearances for Boro, including two this season. He has represented the Netherlands 10 times at under-21 level. The 6 ft 1 1⁄2 in tall Wildschut was born in Amsterdam and played in the Ajax academy. He joined second division FC Zwolle and made 33 appearances for them in the 2010-11 season, scoring 3 goals. In summer 2011 he signed for VVV Venlo in the Eredivisie. Wildschut made 61 appearances for VVV, scoring 8 goals before leaving them in the summer of 2013, after they suffered relegation. In summer 2013 he signed for another Eredivisie side, Heerenveen, on a three year contract. In January 2014 he was sent out on loan to Ado Den Haag until the end of the season, making 7 appearances. Wildschut made 18 appearances for Heerenveen scoring 2 goals. Middlesbrough signed Wildschut in September 2014 on a two year contract for a fee of around £600,000, with the option of a further year. In order to learn more about Wildschut’s time at Middlesbrough we contacted Robert Nichols of the Fly Me To The Moon fanzine fmttm.com. Yanic Wildschut is the kind of player that draws the fans to games. He is fast, strong, powerful and direct. When I say he is fast, let me qualify that by saying Yanic wears athletes compression socks under his football socks. He can give defenders ten yards start and tear past them. A good span of games at Wigan will help him sort out his weak spot, the finished product. Although get him running into the box and it doesn’t matter what he does with his final delivery he will cause mayhem and bag free kicks and penalties by the bucket load. If defenders can knock him off the ball. He is, as they used to say in Mark Lawrenson circles, a very big unit. Wildcshut has been desperately unlucky at Boro. He helped destroy Oldham away in the 1st round of the League cup. He scored a superb break away goal and was generally far too hot for the other Latics to handle. His promotion to first team action was only a matter of time and indeed we saw more of the same from him at home to Bristol City. Every time he got the ball and went on the run Bristol City were running scared. Yanic was subbed at half time in a tactical switch to allow Stewy Downing to go wide. It didn’t work but we have such a surplus of good wide players, wingers and overlapping full backs that no less than three are out on loan at present. It was expected that Albert Adomah would be leaving but he settled his differences with the manager yet in the meantime we had brought in a talented Uruguayan called De Pena. Thus Carayol, Adam Reach and Wildschut have been allowed on loan. They need first team football rather than Development side starts. Wildschut’s debut was as sub at Anfield in the League Cup last season. He was thrown on as a centre forward. And he caused Liverpool threats running through the centre. He scored in League action in a win away at Rotherham. But needs more starts to get consistency. I would be very excited right now if I was a Wigan fan. Wildcshut will destroy defences with pace. He might need a few games to find a level of consistency to impact through 90 minutes. But he is worth the wait because he can split and sprint through a defence in a minute. Watch him go. And watch Yanic grow.